Painting bought by entrepreneur and Saracens rugby club owner Nigel Wray for The Priory Collection, the prestigious museum he has founded dedicated to rare sporting memorabilia and sport-inspired art. 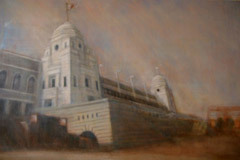 Emma was commissioned by the Football Association in 1999 to paint the final official portrait of the iconic 1923 Wembley Stadium to mark the ‘End of an Era’ celebrations before its demolition. Emma only made two paintings. The commissioned piece now hangs in the Football Association’s formal suite at the new Wembley Stadium. The other work, which was painted at the same time but focusing on a different angle of the Twin Towers, is the one that has been bought for The Priory Collection for an undisclosed sum.